Ed’s family is deeply saddened to announce his passing on July 16, 2017, after a long and courageous battle with brain cancer and the ensuing medical issues. He is survived by his two children, Charlie (Kalli Lahtinen) and Laura (Chris Hetherington), and their mother, Dianne McArthur. His children were the pride and joy of his life and his love for them knew no bounds. He is also survived by his loving partner and best friend, Sharon McKeen, who provided much strength and support throughout their years together. He also leaves two incredible grandchildren, Sawyer and Anna, who meant the world to him. Special thanks to his always caring sister-in-law, Carole Sanford, and his cousin, Linda Parolin, with whom he shared a very special bond. Ed now joins his departed siblings, Mary Lou and Gord. In addition, he leaves several nieces and nephews. Ed had a long and distinguished career in the Canadian Armed Forces, beginning as a cadet at the Royal Military College and ending as Lieutenant Colonel, Director of Security, with DND. He was a kind and gentle man, with a great sense of humor and joie de vivre. He was an avid outdoorsman and nothing gave him greater pleasure than landing a giant Muskie. Ed will be missed by his family and a large circle of friends. 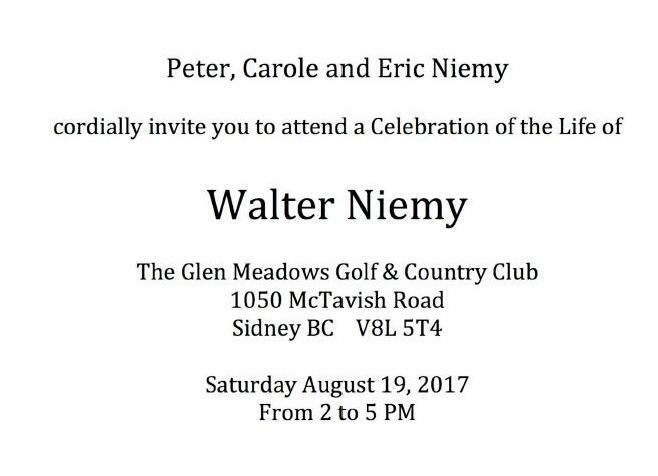 A celebration of Ed’s life will be held at the Central Chapel of Hulse, Playfair and McGarry, 315 McLeod Street (at O’Connor), Ottawa on September 9, 2017 from 2:00 – 5:00 p.m. The family would like to extend a special thank you to the doctors and staff at the Montfort Hospital, who were so kind and caring during Ed’s final days. Ken was born in Shelburne, NS on November 23, 1942 to loving parents Winnie and Ralph Eyre. His father was a member of the Army Corp of Engineers and as Ralph carried out his duties, including the building of the Alaska Highway, Ken and his family lived in various places across Canada. He spent his formative high school years in Whitehorse, Yukon and there developed a lasting respect for Canada’s North. Ken graduated from the Royal Military College of Canada (BA) and served in the Canadian Army from 1965 to 1982, primarily with infantry and airborne forces. He was commissioned into the Queen’s Own Rifles and was subsequently rebadged to the Princess Patricia’s Canadian Light Infantry. During his military career he served twice on peacekeeping missions in Cyprus, one during the period of the coup d’etat and Turkish invasion in 1974. A brilliant scholar, Ken received a MA in History from Duke University in 1967 and in 1974 became the first serving officer awarded a Department of National Defence Fellowship. He chose to work towards a Ph.D at King’s College, University of London. His thesis was entitled Custos Borealis: The Military In the Canadian North, an examination of Canada’s defence policy and operations. As part of his field research, he was posted to Yellowknife and had the opportunity to travel extensively throughout the North, with emphasis on the Northwest Passage and the High Arctic. When it came time at King’s College to defend his dissertation, the College asked the Canadian government for an expert on the subject to join the board in reviewing the paper and questioning the candidate. The single expert Canada could suggest was that of Major K.C. Eyre, MA. The dissertation was accepted and Ken was granted a Ph.D in 1981. In recognition of all his original work relating to Canada’ s North, he was nominated by the Department of National Defence for the 1982 Massey Medal. After retiring from the army, Ken worked for several years at National Sea Products, then became Principal Scientist at Crisis Simulations, a research company designing military battle and disaster training simulations. In 1994, he was appointed the first Director of Studies at the Pearson International Peacekeeping Centre established by the Government of Canada in Clementsport, NS. During his tenure at the Centre, he served in various other positions, including Director of Research and Development, Director of Exercises and Executive Vice President. Ken was instrumental in developing an intellectual focus and a dynamic multidisciplinary approach for the Centre’s peacekeeping training, one that was unique in the world and studied by other countries. Many people still working in the fields of peacemaking and rebuilding conflict ridden countries around the globe are using concepts and principles learned from his work. Ken had an incisive and active intellect and curiosity and did not suffer intellectual sloppiness but as a teacher, friend and husband, he could be gentle and reassuring and was a loyal friend and inspiring mentor to many people. He also had a great sense of fun and whimsy. 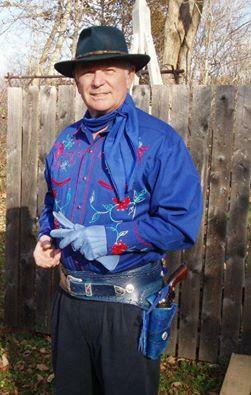 In his retirement years, Ken took up Cowboy Action Shooting, combining boyhood pursuits with a love of target shooting. He and his friends spent many happy days participating in matches with titles such as ” High Noon”, ” The Shooting of Dan McGrew” and “Ghostriders in the Sky. ” Also in retirement, he created driftwood art and garden octopi- huge creatures made from spruce burls he harvested from local forests and lakes that he painted fanciful colours and often named after friends. The love for the outdoors he learned as a boy never left Ken. He was an avid fly fisherman, both in salt and freshwater, and was most content when fishing, particularly on Nova Scotia’s brooks and rivers in the spring of the year and on Florida’s inland waterways during the winters he spent there. He used to quote from a Babylonian proverb often : “The gods do not deduct from man’s allotted span the hours spent fishing. ” All those who mourn his death wish the gods had given him many more hours. Ken died on July 13, 2017, shortly after being diagnosed with Acute Myeloid Leukemia. He leaves his wife Carole (Annapolis Royal), his sister Heather and brother in law Raymond d’Entremont ( Lower West Pubnico), niece Corinne d’ Entremont (Killeen, Texas) and nephew Peter d’Entremont (Ottawa). A most fond memory from 1965 fishing Specks in Algonquin Park with Ken, John Dodd, Terry Enright and Ted Hague. Ken’s dad had driven us into Brent. So sorry to hear this news. First met Ken on a train Ottawa to Kingston (RMC) in 1960 to be “entertained” by entrance exams and the dreaded selection interview. Both met up again at CMR where we shared 5 years of academic studies during the winter and infantry phase training during the summer. A brilliant officer with whom I had the privilege of serving together in the Airborne Regiment. It was great reuniting in Florida a couple of years ago to get caught up and share some “lies”. My sincere condolences to Carole and his family .